This month (August 2017) family historians in Australia and New Zealand have a unique opportunity to hear leading international genealogists Chris Paton and Dirk Weissleder explain how to research our British Isles and European ancestors. 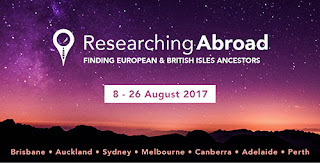 Chris and Dirk are giving a series of presentations during Unlock the Past's genealogy roadshow entitled Researching Abroad: Finding British Isles and European Ancestors. Right now the roadshow is in Auckland, then it moves on to Sydney, Melbourne, Canberra, Adelaide and Perth. On the roadshow's main page, click on your city to see full programme details and a booking form for that venue. There are also links to pages about the speakers, prizes, special offers, sponsors and exhibitors. I thoroughly enjoyed the 2-day event in Brisbane. Chris Paton (an engaging and entertaining speaker) talked about many aspects of Scottish and Irish genealogy. He packs a huge amount of useful information into his talks! I also learned a great deal from Dirk Weissleder, who spoke mainly about resources for Germany, Poland, Prussia etc. He highlighted the importance of using maps to determine where our ancestors lived, and the reasons for (and problems associated with) boundary changes. He also explained why 'understanding how Germans think' can be an advantage if you want to contact record offices or visit the area where your ancestors lived. While Chris and Dirk took a break, local speakers briefly described MyHeritage technologies, and British and European resources held by libraries and societies in Brisbane. Unfortunately we didn't learn much about the Genealogical Society of Queensland's holdings, and I was disappointed that the Queensland Family History Society didn't do more to promote their magnificent index 'Emigrants from Hamburg to Australasia'. In each Australian city a different (local) person will give an introductory talk about using DNA tests (a genealogy tool that is starting to pay dividends for me now). I didn't let myself get carried away at the roadshow's bookstall, but there are some good discounts available. There are also great prizes to be won at each venue. And of course, it's always fun to catch up with friends and colleagues whom I rarely see, and to meet new people who share my passion for family history. For a more in-depth report, see Pauleen Cass's posts in Family History Across the Seas. Disclosure: Unlock the Past gave me a free ticket to the roadshow, but my comments here are my honest opinion and would be exactly the same if I'd paid my own way.